The Foundation was pleased to be present when the former First Lady of the United States visited Scotland. 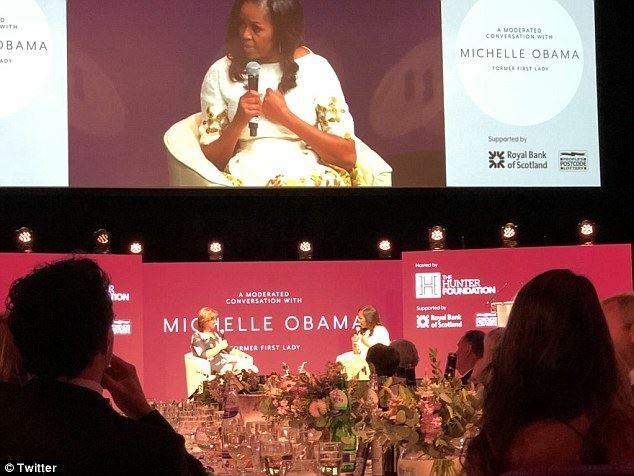 She told a full Edinburgh International Conference Centre audience about her life in The White House and how she was encouraging women and girls everywhere to reach for the stars. The event was a charity fundraising occasion organised by The Hunter Foundation set up by inspiring entrepreneur Sir Tom Hunter. All profits from the event are being invested in hundreds of charities across Scotland. Her attendance at the charity gathering sees her follow in the footsteps of her husband, the 44th President, who visited Scotland in May last year for a similar event with the Foundation. In her eight years in the White House, Mrs Obama worked to transform the role of first lady, becoming a role model and champion for women and girls across America and beyond. The Harvard law graduate led initiatives aimed at tackling childhood obesity and together with Jill Biden, wife of former vice president Joe Biden, worked to improve life for servicemen and women and veterans. Her “Reach Higher” programme aimed to inspire more young people in the US to continue education after high school by going on to college or university while she also continues to campaign to help more girls across the world attend school.